If you had to explain the plot of The Wizard of Oz in under 5 minutes, could you do it? 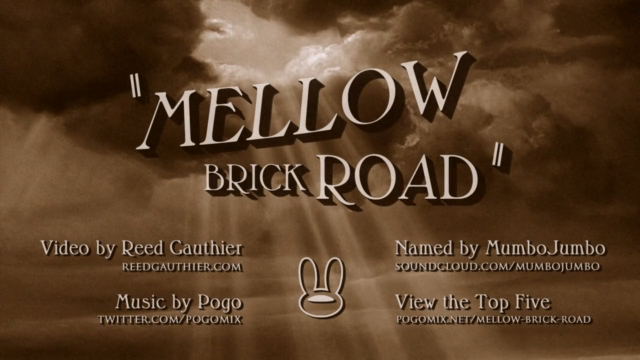 Well that’s what the winner of Pogo’s “video response” competition to their “Mellow Brick Road” mix managed to do. Pogo a.k.a. Nick Bertke splices together music, sound clips and dialogue from movies, turning them into songs. The epitome of Everything is a Remix, the tracks he creates are often as enjoyable–sometimes moreso–than the originals. Out of 44 responses to the original video and track, Reed Gauthier‘s submission takes a very basic style of animation but manages to encompass the entire plot… in an abbreviated fashion, of course. As cute as the mashup mixes are, I don’t know if I could listen to them without the accompanying videos. As they’re two of my favorite childhood1 movies, I like his takes on Mary Poppins and Willy Wonka & the Chocolate Factory, but after listening to a few tracks, I think I need some normal music now before I start to hear everyone around me in stuttering clips. I love Pogo. His “Up” and “Alice” are wonderful.